Idomeni refugee Camp by night, Greece, May 2016. Words : Véronique Saunier – What future for “Quechua babies”? Tightly wrapped in a kundakah Noura is sleeping quietly. Before leaving Syria on the long journey to Europe, her young parents neatly packed several sets of the traditional pieces of cotton in which babies are wrapped for the first two months of their life. Noura’s father, Mohammed, recalls how he carried his daughter’s trousseau in his backpack all the way from Syria and how he refused to give it up when they had to get rid of most of their possessions before boarding the small boat taking them across the Aegean sea. Noura is one of the hundreds of babies who were born in Greece to parents fleeing their country to seek asylum in Europe. It is difficult to find statistics. Even the UNHCR does not have exact figures. Fotini Kesedopoulou, Protection expert at the UNHCR in the now defunct Idomeni camp near the border of Macedonia (FYROM) says that the population, which reached more than 12,000 people at its peak, was fluctuated too much to keep count of newborns. However, just before the camp was evacuated at the end of May, the independent Greek NGO Praksis was distributing nappies for babies under three months old to 125 families and milk formula to 12 mothers who could not nurse their children. This gives an idea of the newborn population in a single camp. Heven, Noura’s 19 year old mother, spent the last three months of her pregnancy in the Idomeni camp, the point where she and the rest of the family were hoping to cross the border to Macedonia (FYROM) and then go all the way to Germany to rejoin other family members. She certainly did not expect her daughter would spend the first weeks of her life in a tent. The majority of refugees’ babies are born in local hospitals but some, whom the medical staff affectionately call “Quechua babies” (after the brand name of the most popular kind of tent), don’t make it to the hospital and are born in makeshift conditions. “It can be quite challenging,” recalls Isabelle, a medical officer with Médecins du Monde, who has helped deliver babies in such circumstances. What is certain is that all these newborns spend the first weeks of their life camping in the most extreme conditions. But what is in store for them might be even more challenging. Like many displaced people in the world, proving their nationality might become an issue. Ironically, in French the translation for the word stateless, “apatride” comes from the Greek word patris and means “without an ancestor’s land”. 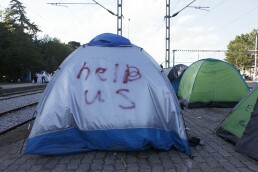 Greece might be unintentionally creating future stateless individuals. When asked about her nationality, Noura’s parents answered that she is of course Syrian. But other parents of newborns said they hoped that because their child was born in Greece, it would enable the family to get a European passport. Most of them had no idea. According to UNHCR’s Kesedopoulou children whose registration is not done properly are at high risk of being stateless. “Since there is no way to declare the birth of a child at their country’s embassy, it is important that parents follow the Greek registration process thoroughly to make sure their child does not become stateless,” she explained. The registration process requires several steps that not all parents are aware of, especially as all the documents they are issued with are written in Greek. Typically, the child is issued a temporary birth certificate from the hospital. With this document in hand, parents must go to the local police office to certify the name of the child and to make a joint statement. It is important that both parents jointly declare the child. In some cases such as under Syrian law, only men can pass citizenship onto their children. “Syrian law states that their citizens have to follow the personal status law of the country they are in. In terms of preventing statelessness, if a legitimate Greek birth certificate has the name of the Syrian man as the father then the child is Syrian,” explains Zahra Albarazi of the Institute on Statelessness and Inclusion, an organisation based in the Netherlands. In the case of Noura and of the other babies we met in the camps who have both parents, their nationality can be easily established if proper registration has been processed. However, for Syrian babies born to single mothers, establishing their nationality at the moment is virtually impossible. “A change in Syrian nationality law – allowing Syrian women to transfer their nationality as well as men – would solve the problem,” reckons Albarazi. She co-authored a report on behalf of the Norwegian Refugee Council (NRC) that studies the interaction between statelessness and displacement, and particularly emphasizes statelessness as a consequence of displacement. With nearly 9 million Syrians either internally displaced and refugees and numbers continuing to rise, there is a clear risk of statelessness among the displaced Syrian population and especially among newborns. “It is important that we raise as much awareness as possible among refugees about the importance of documentation – although lacking documents does not mean they are stateless, it can certainly put them at risk in other contexts,” added Albarazi. 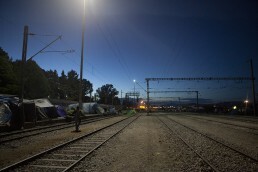 “An official birth certificate is essential to apply for asylum,” assured Kesedopoulou. The UNHCR and the Greek authorities have used this argument to encourage refugees to leave open camps and to relocate to official camps where they say babies will be registered systematically and asylum applications processed more rapidly. This is an important incentive that many families have taken into consideration when moving to government-run camps and that makes their life under difficult conditions more bearable. We must hope Greece’s migration department will be true to its word and will respect both its promise to register babies born on its soil and to speed up asylum applications for all refugees. At the time of writing, Noura and her parents have made it to Germany, where they have been reunited with the members of the family who had already relocated there. At just a few weeks old, Noura was smuggled into Serbia from Greece, carried by her mother across the Macedonian hills, and then driven from camp to camp from Serbia to Hungary and finally to Germany. Chances are that there her status will be regularised and that, with her parents’ support and resilience, she can look forward to a bright future. Meanwhile, in the makeshift Kelibija camp, located at the border between Serbia and Hungary, an actual “Quechua baby” is also waiting for happier days. Four month-old Rodin (“Sunrise” in Kurdish) was born on 26 March at the Idomeni camp, just days after the fateful closure of the border between Greece and Macedonia. Rodin’s 24 year-old mother Amina (photo), was sent back to the camp by the medical staff at the Kilkis hospital, who assumed she was not ready to deliver. But she gave birth in the tent she was living in with her husband and two other daughters. Rodin was less than three months old when her family started the long, treacherous trek across Macedonia. “I was ill and when I collapsed and could not walk any more the smugglers left me and my family behind,” recalls Amina. They found their way to the Serbian border by themselves after a ten-day trek. The whole family is now camping next to the barbed wire fence that separates Serbia from Hungary, just by the special gate through which, every day, 15 refugees are allowed to cross the border before being driven by bus to yet another camp in Hungary. In their hurry to leave their hometown, Kobane, in Syria, the family did not take their identity documents, which makes their potential relocation even more challenging. Quechua tent, Idomeni refugee Camp, Greece, May 2016.